I don’t really know where to begin this post. If you haven’t gathered, it’s about my cat. I guess I’ll just begin, as everything does, at the beginning. 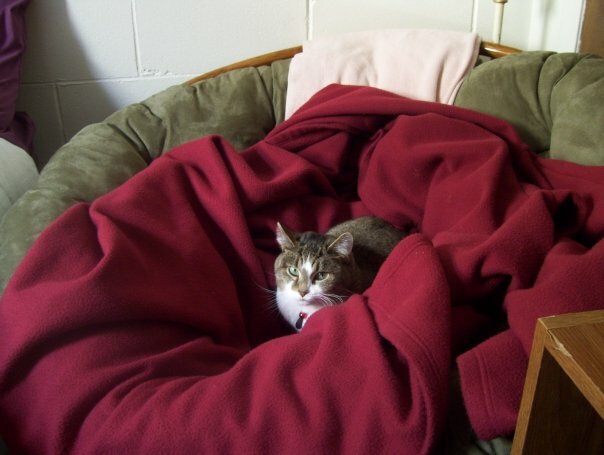 One snowy evening in the winter of 2008, I drove to a stranger’s nearby apartment in the middle of a snowstorm to pick up a cat. 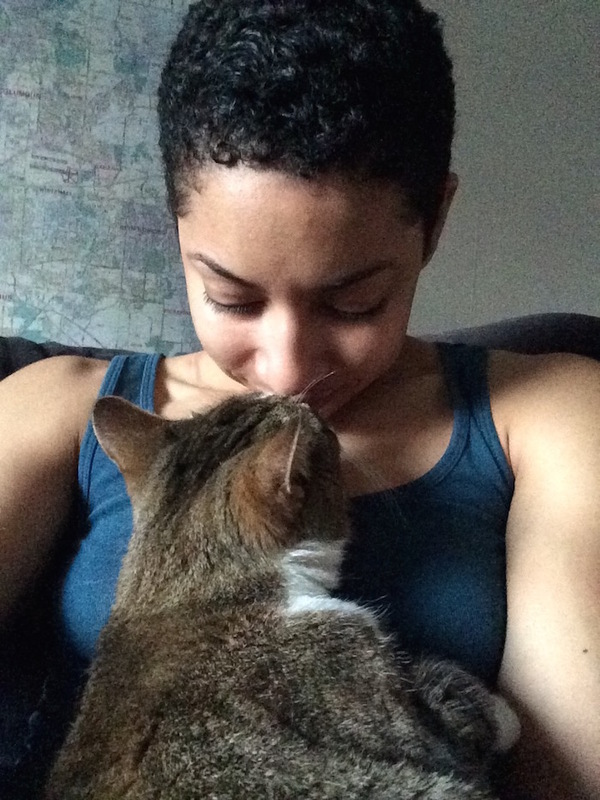 I can’t quite remember what made me decide I needed a cat – after all, I’d never had a pet before and I was still in college – but nevertheless I politely asked my roommates if they’d mind having a new friend around and soon stumbled across an ad for a free cat on the now long-defunct Facebook Marketplace. Her name was “Kitty” and they were getting rid of her because they’d gotten a chihuahua; the two weren’t getting along. I gathered her in a flimsy cardboard carrier printed to look like a house and she cried for the whole five-or-so minute ride to her new home. 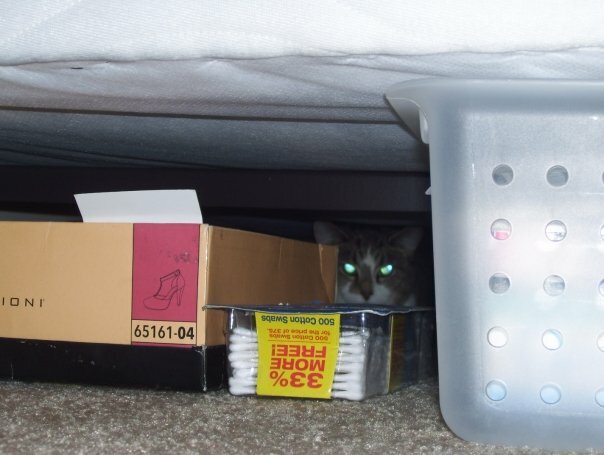 For a few weeks, she was very scared and hid under my bed all day most days. She was in a weird, new place with a weird, new, weirdly giddy lady. But slowly, she warmed up, and we’ve been inseparable ever since. Mony has been my constant companion for eight years. Through college graduation, and through jobs that seemed to nearly kill me. Through a marriage that didn’t work out. Through the times I was so depressed I could barely get myself out of bed in the morning. Through move after move, apartment after apartment, state after state. When I’m sick or sad, Mony curls up into the space between my arm and my body and stays there until I feel better. When I act like I’m too busy to pay attention to her, she (mostly) understands, and she loves me anyway. She runs to the door to greet me when I get home, no matter how long I’ve been gone, and when I see her, everything feels okay again, whether or not it actually is. I could never have imagined just how much I would love a ridiculous, 7 lb. creature. And for as long as I get to have this tiny, special angel in my life, I will be grateful. Awww! Shes so cute! I know what thats like, my cat Kitty had been through almost my whole life with me. She was my sweetheart for sure. I’m sad she passed but shes definitely on to greater things. What is the life span of a cat? I have no idea, but happy b-day to your furry friend! Mony is so cute and adorable! Happy Happy Birthday Mony! I’ve always loved cat. I wish I could get one for my daughter but she’s allergic to cats. Oh my goodness she’s so cute! I have a cat, and couldn’t imagine not having him. I am a total cat person. She’s a pretty girl! Happy birthday to your fur baby! This truly just made my day! I feel the same way about my Anabelle (maltese mix). They’re family and give such wonderful love. Beautiful kitty! Cats are so wonderful. We ave two, Jinx and Josie, and they always put a smile on our faces. Hope you had a great birthday Mony! You’re super lucky to have a companion like that. Aww this is so sweet! What an adorable post 🙂 happy birthday to Mony! Happy Birthday Mony! 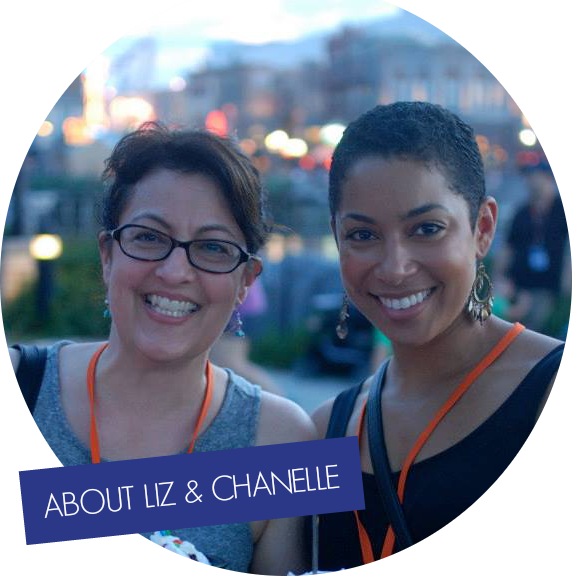 Thank you for sharing your story with us. How beautiful your relationship is! I am the same with my cats. They are absolutely the loves of our family. Can’t imagine how we would be without them! Such a sweet post. Pets are really angels in disguise and they seem to love you unconditionally. Happy birthday Mony! Aww, what a great relationship! Happy birthday Mony and many more…..
What a beautiful relationship 🙂 It must be nice to have a furry friend to accompany you through everything. Pets will always love you! This is so cute. I have a little dog but when I moved to Wales I left him back home. my only concern is how to bring him here with me. Unfortunately I cannot find an apartment here that is pet friendly. Happy birthday Mony! I love the way you express your love for your kitty here. She is quite fortunate and so are you! Happy Birthday Mony! A truly wonderful, loyal and true friend/companion. No joke this literally brought tears to my eyes, Mony is more than just a cat but a best friend too. Just look at the smile she is giving you in the selfie where you are cuddling her. Such a sweet cat. I have two dogs. These animals can really become your bestie. I couldn’t live without my two best friends anymore. They are my little fur babies. As I can see, that cat is too! You kitty is so pretty! We’re mid-move right now, but we’ve already talked about and agreed on getting a cat as soon as we’re settled in our new place. My baby also is ten years old, Mony is really cute and she’s look so happy with you. She is indeed a beautiful cat and Happy Birthday to her. My sister’s cat just passed a few days ago. She was the only talking cat I knew. I have always loved cats but my kids are allergic so I have a dog. Pets are for sure our best friends. Thanks for sharing you gorgeous lil princess. She’s beautiful. I think I would love having a cat, but my allergies to them are so bad I can’t. I’m so glad you have a great companion. aww bless them:) Cats make me sneeze, but funnily enough my guinea piggles dont, I love my piggles. Happy Birthday to your baby kitty. I hope she enjoyed her special day and new fun treats and toys. What a cutie Mony is, Happy Birthday. I miss my cats, one lived to about 20 years old. Happy Birthday Mony!! This makes me want to get a cat even more – so cute! Happy Birthday cute kitty! Love this post! Happy 10th birthday to Mony! I can feel the bond through this post…I thought you were gonna tell me you had a real 10 year old kid you were hiding from us! Now that would be quite a twist! So very cute, happy birthday!!! I have an aunt that just loves her cats and they’re pretty cool, I’ve never had one but really want to. What a cute kitty! My Socks turned 11 in March. She was born under my bed when I was a senior in high school, and I can’t imagine life without her. Here’s to many more years with your best bud! She s cute, I have a cat myself and I feel identified with the relationship you have with her. I wish you the best for both of you! awe, so cute. Happy birthday. I used to have a couple of cats and I loved them so much. She’s really cute! Happy Birthday Mony, you’re awesome please take care your mom lol. Your cat is beautiful! Although I never tried to have cats for pets, I still think they are pretty animals. And a whole lot quiet than dogs. BTW, Happy birthday to her! What a cutie! Happy Birthday Mony! My dog Rhett is coming up on 15 in August and he has been through SOOOO much with me. Basically my entire adult life. They are so special. How sweet, I’ve always thought that cats can be the best companions. Happy Birthday to your friend! Awww so cute! Happy birthday Mony! Cats are great companions, I babysat a cat named Boudini once and he was the sweetest with his tongue always out. He, however, did not understand when I couldn’t pay attention to him. Adopting a cat is a big step. Mony is lucky to have your for a mom. The pictures show how happy she is and how much she cares for you. Happy birthday, Mony, and many more. What a blessing to have your cat so long! I’m sure you have brought just as much joy to her life as she has to yours. Mony seems to be very cute. I’m more a dog person but cats are also adorable. Congratulations to Mony and you! Aww how cute! I love cats. They are the best snugglers! That’s such a sweet message for such a cuddly baby! Happy 10th birthday to her and I hope you have more years together. It’s nice to have a companion like Mony. I’m sure you guys have a lot of memories together, you’ve been through so much! Happy Bday Mony. Having a pet is the best thing. It’s so nice to have a furry companion to come home to, and to see you through life’s ups and downs. Happy 10 years! Your Mony’s skill to detect a keeper is something that I must acquire myself, haha. Aw so cute! Our oldest cat was 7 when she passed away, I wish she was with us longer. I am such a huge pet lover. Happy Birthday to your fur baby! IM terribly allergic to cats but yours is so cute! I wish I could have one! Happy Birthday Mony. Your cat baby is so cute. Bless. So funny! I read the title and thought, I didn’t know she had kids. From one fur mom to another, I get ya! Pets are amazing creatures and become part of the family. 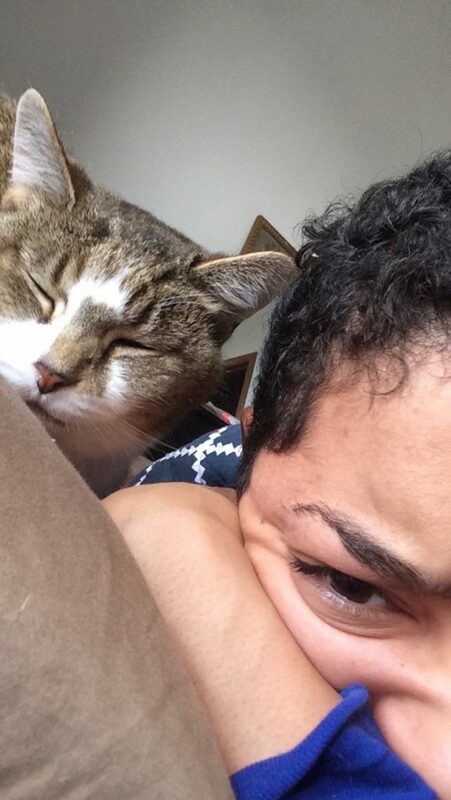 oh mony is so cute.Happy birthday mony.i would love to have a cat.Well hope so..may be one day ! Happy Birthday for your baby! 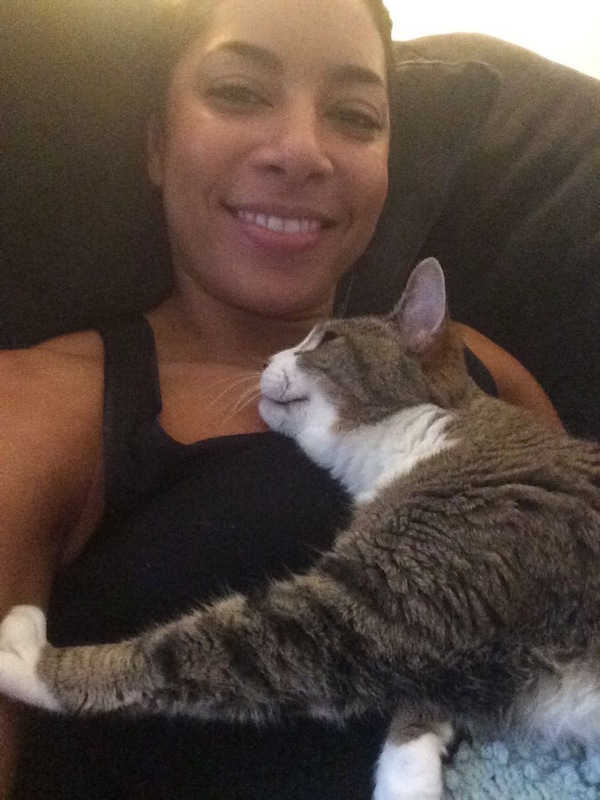 Awesome pictures of you and Kitty! Mony is really beautiful and I’m sure a wonderful companion. I love my pets as well, they are more family to me than some of my family is lol. Happy Birthday Mony. Happy 10th birthday to your baby! What an adorable kitty, looks super soft! I love cats! I had two but unfortunately one of them didn’t make it to his 7th birthday! We still have my little girl though, Tequi, and I love her to bits! 7 in June! Awww that is really sweet. Happy Birthday to Mony-bear; I love the bond you guys have. I hope to have that with our future pet. Awww, what a sweet kitty! Happy birthday! Great shot of the black and white. Happy birthday to your cat. 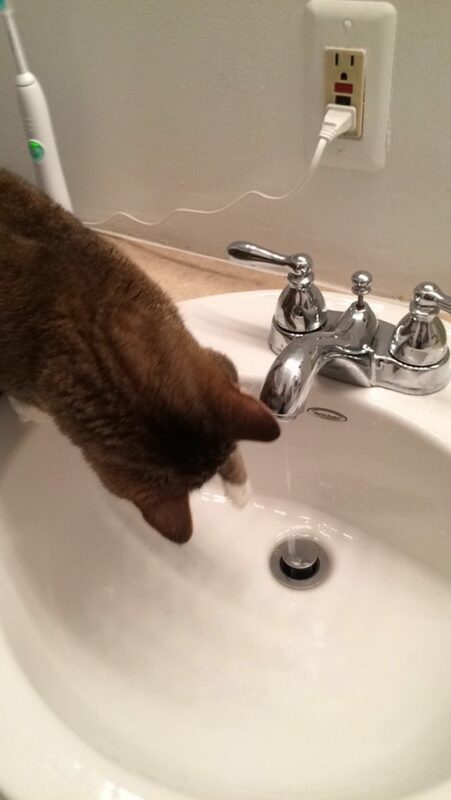 Aww your cat is adorable, she reminds me of a friends cat who also loved drinking from the sink! Happy Birthday!! Ten years is a long time for a pet to become part of your family! Looks like you love them very much! Pets are so wonderful. Usually so forgiving and loving. I can’t imagine a household without one! My baby is only one and I already love her to pieces! She’s not a friendly cat, but she follows me everywhere! It is sweet that you have such a loving and long-lasting relationship with your cat. What a heart-felt, beautiful story! It’s so good to know that your pet loves you unconditionally in good times and bad. Happy Birthday, Mony! She’s a doll! Monty looks like a peaceful cat. Happy birthday.My favorite pets are dogs but I understand and respect other pet owner preference…Great images. Happy B-day Mony! I couldn’t imagine life without my cat! I can totally understand how you feel since I have my own furry cat friend. Happy birthday to your Mony. She is so adorable! YAY for your beautiful baby. 10 is the new 5 they say and your cat is gorgeous. Happy Birthday! What a very cute cat. Here’s to many more years to come!! Ah! So cute!! 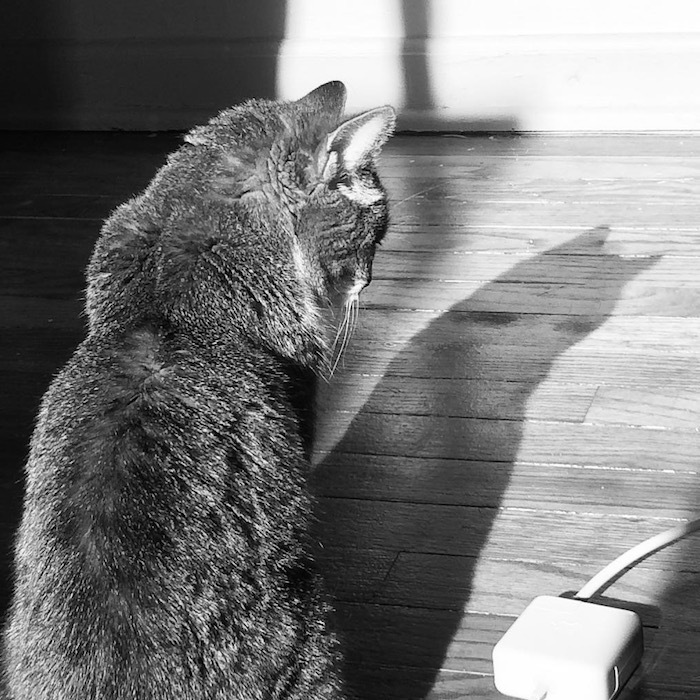 I do think Cats have a special aura that keeps us sane. They always know when we need them. Happy Birthday Mony! Cats are great pets. I hope Mony got a special treat for his birthday. Mony is such a cutie pie. It is so nice to have a furbaby you can rely on to make you feel better. So can I first say how much I despise people who dump the “old” pet in favor of the “new”? But in this case, it worked out for you and especially for Mony – you two sound like you have an amazing bond. 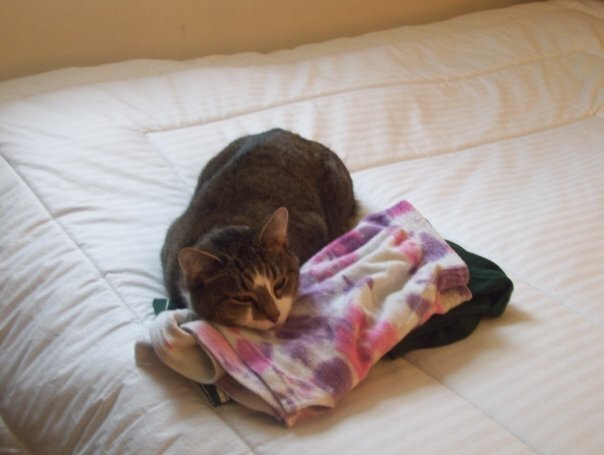 FYI, I’m a crazy cat lady with nine currently… our tenth, Blueboy, would have been 16 years old this month. He had to be put to sleep on March 30th. He was nearly 16 and I’m turning 32 in June, so you can do the math…I spent half of my life with that cat. I’ll miss him forever. Anyway, back to you and to Mony: Happy 10th Birthday! I wish her many more healthy years with you. Happy birthday to your cat! I have two cats of my own and they’re actually brothers. They look so much alike too. I absolutely love cats and all kinds of animals. Aww Happy birthday Mony! Those furry babies take up such a special place in our hearts. Happy Birthday!! I love my cats so much too. One is having a birthday soon and fresh salmon will be on the menu. As the mom of two dogs and a cat, I totally understand the love you have for your sweet Mony. Our pets bring so much happiness into our lives. Aww.. double digits! That is so sweet, sad and true. They’re with us through everything. I know how it is to be so sad you can’t get out of bed, and your pets are so there for you. Aw isn’t it amazing how they creep into our hearts without us even noticing till it’s too late. Our babies are so spoiled they are never allowed to leave. Your cat is so pretty! I absolutely love cats. I WISH I could have one, but they make me break out into the most horrible hives ever. Awww, happy birthday Mony! Sounds like you two have been through a lot over the years. I am wicked allergic to cats, so we have a dog – his name is milo.